This tiramisu is so delicious, it could possibly land you in the hospital. Seriously, it is so rich, yet delectable, I want MORE!!! My blood sugar has to be through the roof right now. In taking the best of both worlds, I mixed up my Boston Cream Tiramisu with my Amaretto Tiramisu recipes and came up with this baby. It's my favorite one! It could only be improved if I can figure out a way to incorporate Violet Crumbles candy bars into it. Tiramisu is better if created the day before and allowed to sit overnight in the fridge, 12-24 hours should do it. This works out perfect for special events, because it presents beautifully, even though created the day before. Just wait to add any whipped cream on top until you are close to serving time. 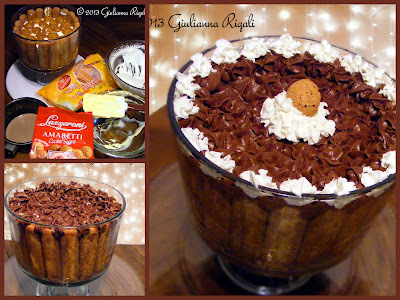 Both cookies, Danesita Lady Fingers and Lazzaroni Amaretti Cookie Snaps, used in this dessert can be acquired through Cost Plus World Market. However, if by sharing this delicious slice of heaven with you, they run out of these cookies, you are in so much trouble! Do not take the last package, place it back on the shelf in my honor (wink, wink). Disaronno Amaretto can be picked up at most any store, if you are of legal drinking age. However, I will share with you, if you prefer to make this dessert without alcohol, the amaretti cookie snaps give it enough amaretto flavor to satisfy! Mix two packages of hot cocoa mix with two cups of hot milk. Set aside, to cool. In a small saucepan, whisk together the egg yolks, sugar, and 2/3 cup of milk. Cook over low heat, stirring constantly, until thickened, about a minute after bringing it to a gentle boil. Be sure to keep stirring and keep the heat low or you will end up with scrambled eggs. Cool enough to pour into a bowl and immediately place plastic wrap over it, touching the surface of the custard to keep it from forming a film on top. Refrigerate for one hour. Pour 2 cups of heavy whipping cream into a deep bowl. Stir in vanilla and sifted powdered sugar. Beat on high until peaks form making a whipped cream (do not over beat it or you will have butter instead). Set aside in refrigerator. After one hour, remove custard and beat in the mascarpone cheese (which should be at room temperature). Add a splash of Amaretto liqueur if so desired. 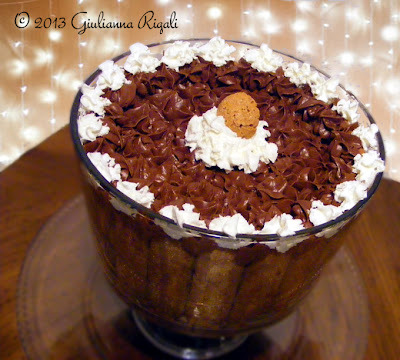 Using a trifle dish, dip each of the lady fingers in the cocoa you made earlier. Layer 4-5 on the bottom. Continue dipping the lady fingers in the cocoa and standing them around the sides of the trifle dish. The entire package should be used. Now layer half the custard, then 1/3 of the whipped cream. 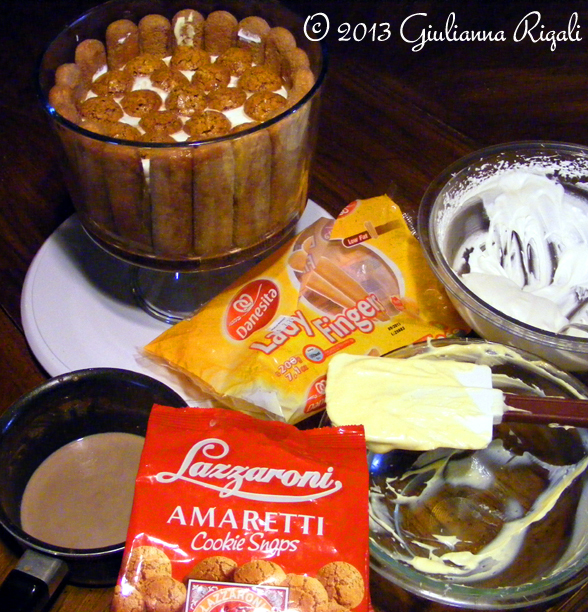 Now dip the amaretti cookies into the cocoa and place a layer over the whipped cream. Again, layer the other half of the custard filling and 1/3 of the whipped cream, and one more layer of Amaretti cookies. Place in the refrigerator. Now to make the ganache, in the top of a double boiler, melt your chocolate chips and 1 cup of heavy cream over low heat. Stir occasionally until melted. Remove pan of ganache from over hot water and set aside to cool. Once cool, beat it until creamy. 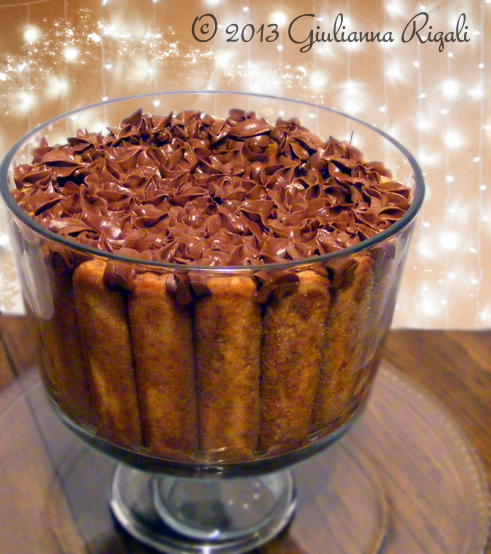 Put inside a decorator bag and pipe it into stars or flowers on top of the tiramisu. Refrigerate for 12-24 hours. When ready to serve, garnish with additional whipped cream and amaretti cookies.